There is a bottlo on the Eastern side of the main drag at Newport, which never fails to deliver some obscure beer buried in its cold depths. BotF ventured to North Palm Beach recently for a picnic organised by the now dormant contributor – Will – and took the opportunity to pull in and see what was in the fridge. 3 new beers were yielded including this mighty beverage. I didn’t really look closely at what I’d purchased because the wife and kids were in the car. It was only upon arriving at North Palmie that I realised that this dark and mysterious bottle wasn’t a beer to have in the sun at North Palmie. 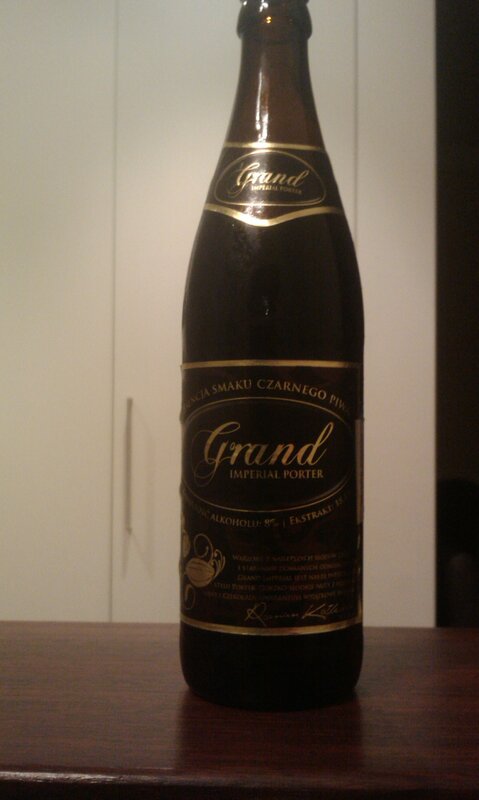 Grand Imperial Porter, which is made by Browar Amber in the “morainal hills of Gdansk” is a 500ml 8% Polish porter thatwas far more suited to evening deckage and being consumed from a glass. In the end I did neither, but enjoyed it slowly nonetheless, watching Chelsea win the league at Charlie’s place. This is a mighty beer. Deep, roasted and toasty and very flavoursome. You’ve got to love the Eastern Europeans and their 500ml bottles of highly charged pleasure.